1. For me, it's making me post things that I'm not completely satisfied with, just because I have to post something. 2. That's not supposed to be the point, but I just can't put as much effort into 30 posts in 30 days as I otherwise would. 3. Therefor, I am not as proud of my posts right now. 4. 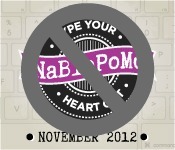 I think perhaps NaBloPoMo isn't actually for someone like me, who has something of a regular posting rhythm. 4. It is more for those who are inconsistent bloggers and need to push themselves to post more often. 5. Sure, I take lots of pictures with my phone, but I can't imagine anyone needs to see any more of them than I already share. 6. And sure, I'm a little crafty, and I cook a little, but this is not a craft or cooking blog, so posting things like that should not dominate. 7. Erica at Yeah Write has been so supportive, even inviting those on the NaBloPoMo grid to enter posts on the challenge grid. But, see #3. 9. ....complaining about NaBloPoMo. Because I chose to do it and I'm too stubborn not to finish, but I'm not really enjoying it! 10. Will someone PLEASE make sure I don't sign-up for it next year?? I mean, seriously, reach through the computer screen and slap me if I even mention it! You know what it is? Blogging is not supposed to be challenging. It is supposed to be the one thing in my life that is pretty easy. I feel like writing all the time. But if I don't feel like it, I don't have to. Right now though, NaBloPoMo is saying I have to. It's like it thinks it's the boss of me. Well screw you, NaBloPoMo! I will finish out the week and then NEVER AGAIN. *Could be that I'm just in a bad mood, frustrated, PMSing or fed up with something else entirely and choosing to take it out on NaBloPoMo**.